Let me just tell you from personal experience (today) that having a couple of these badboys kicking around the shop or garage when there are 50-70 mph wind gusts, rainstorms and power outages can make life a whole lot easier. Tripod base with articulating head and much led brightness that isn’t too hard on the batteries. There are some places where candles are just not a good idea. 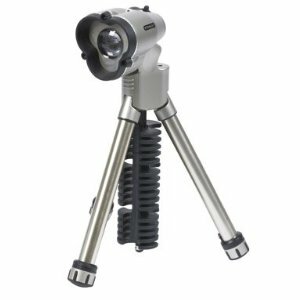 The tripod folds down into a straight handle, conventional type flashlight. Great stocking stuffer. Hint hint.